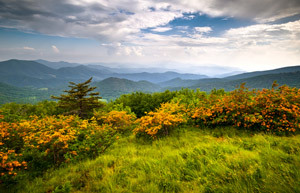 The Appalachian Mountain range is one of the oldest ranges in the world. Our mountains offer ancient wonders. Blowing Rock is a resort town in the High Country. The village offers an unsurpassed lifestyle in a truly stunning mountain location. Imagine living amongst the clouds and along ridge lines that overlook some of the most beautiful valleys and gorges in the Blue Ridge. The Village of Blowing Rock has long been hailed as one of the best kept secrets in the mountains. Search for properties for sale in Blowing Rock; our site is the most comprehensive place online to search for Blowing Rock North Carolina Real Estate for sale. Families have been escaping to its borders for centuries to enjoy summers. Today, this thriving area is home to an idyllic downtown with a great park and several gorgeous historic churches, and nearby shops. A premier resort area, Blowing Rock is a place where you can and your loved ones can gather and make memories. It borders the Blue Ridge Parkway as well. Find properties of Blowing Rock North Carolina Real Estate that are close in to the conserved lands of the parkway. Not familiar with the parkway? It’s a federally protected recreation area with preserved lands and a driving route that spans from Virginia thru the most beautiful areas in North Carolina. Locations in Blowing Rock rest at about 4,000 feet above sea level give or take. The views are some of the best in the High Country. Many properties are historic retreats that have been maintained, added to, or renovated. There are several old neighborhoods in Blowing Rock, some of the most lovely historic estate homes surround the Blowing Rock Country Club. In addition to these stately mountain homes, there are many properties including luxury Blowing Rock condos available in the new developments of Sunalei Preserve, Tanawha at Blowing Rock and Turtle Creek on the Parkway. Browse the best, most comprehensive site online for Blowing Rock Real Estate listings. We would love the opportunity to help you find your dream home in the mountains. Contact the agents at The Mountain Group at Premier Sotheby’s International Realty.